Flawed but sounding quite lovely when handled correctly, Valve Exciter is characterful, effective and very affordable. Two distinct valve flavours. Musical EQ section. Good price. Valve-tailoring Bias control. Levels can be tricky to fine-tune. Valve frequency response is idiosyncratic. Valve compression by-product not always desirable. 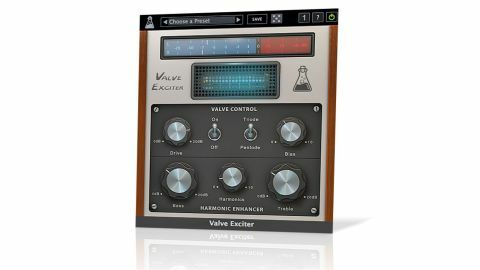 Valve Exciter is a valve-emulating harmonic exciter plugin (VST/AU). Like the valve section of AudioThing's Valve Filter VF-1, it's built on an ECC83 valve emulation, although this particular model is very different to that of its sibling, delivering a mellower sound. Valve Exciter comprises three sections: in signal flow order, these are a solid state preamp emulation with Drive control (0-20dB), the ECC83 valve emulation with On/Off switch, Bias and switchable valve mode (Triode or Pentode), and, finally, the post valve EQ section with Bass, Treble (0-20dB boost) and Harmonics controls. "Triode is great for darkening edgy sounds and introducing subtle harmonic grit. Pentode mode is far more hi-fi"
The interface is topped and tailed with global Input and Output level controls (-infinity to +3dB), which are revealed in the lower half of the window using the number icon in the menu bar. It's all pretty conventional stuff, for sure, but on closer inspection, there are some interesting things going on. First, the Bias control emulates the bias in a valve amplifier. In both Pentode and Triode modes, increasing the Bias makes the valve less sensitive to level (thus requiring more level to achieve harmonics), and increases the relative level of even harmonic distortions. Then, in the EQ section, winding up the Harmonics control adds a small, broad peak boost at around 1kHz, but also, and more significantly, jointly adjusts the centre frequency points for the Bass and Treble controls. Exact frequencies aren't quoted, but they range from roughly 70Hz and 7kHz (at Harmonics 0) to 325Hz and 12kHz (at Harmonics 10). Valve Exciter is very sensitive to input signal level, so it's good that it enables full control of it via its various gain stages. The preamp Drive control is used to adjust the level into the valve, introducing harmonics - however, high input levels can easily result in internal clipping, generating a lot of nasty higher harmonics. Care needs to be taken, then, and checking the output meter, which monitors the signal before the Output control, helps considerably. Another unusual trait is that increasing the Drive eventually starts to curtail the higher frequencies - good for smoothing out bright, edgy sounds; not so good when you want to keep things 'hi-fi'. This starts at around 5kHz in Triode mode and around 10kHz in Pentode mode. Valve Exciter delivers two distinct flavours. Triode is great for darkening edgy sounds and introducing subtle harmonic grit; it works well on crunchy drum loops and is particularly good for adding presence and mid-range dirt to overdriven guitars. Pentode mode is far more hi-fi, suited to kit overheads and acoustic guitars. In both modes, as the Drive increases, the valve emulation introduces compression-style pumping to sustained sounds, which can be good in certain circumstances but irritating if you just want harmonics without any dynamics. The EQs are a useful way to further shape the top and bottom ends following the valve stage, without adding any further harmonic distortions. All told, Valve Exciter is an intriguing plugin capable of some great sounds; although it can also be a little frustrating at times. It's keenly priced, and AudioThing is a very responsive small developer, however, so we expect future updates to fine-tune its performance.